Critiki now boasts more than 1,000 pictures, thanks to a recent influx of images. One exciting development comes courtesy of the Los Angeles Public Library, which has provided images from their extensive menu collection for inclusion in Critiki. 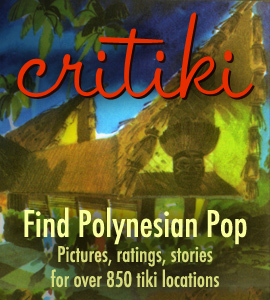 Many mahalos to the fine people at the LAPL for making it possible to share these images with tikiphiles. Another great addition has been dozens of swizzles from the collection of Andy Johnson. This, plus a smattering of contributions from other Critiki visitors, has pushed Critiki’s image count up to 1,050. If you have pictures you’ve taken or items in your collection that you’d like to share, you can submit your images to Critiki at the Critiki Photo Upload page. There are a few caveats (the image must be big enough, and it has to be yours and not someone else’s), but it’s overall a very painless exercise. If you have already put your images up on a website, I can sometimes grab them from there, too (Shutterfly is a no-go — the images are too small). If you’d like to keep up with the updates and additions to Critiki, there’s a handy-dandy RSS feed. Thanks so much to all who have contributed to the Critiki historic archive! I love how you integrated LA Public Library’s collection of menus into your site. It adds historical depth to this fine site.